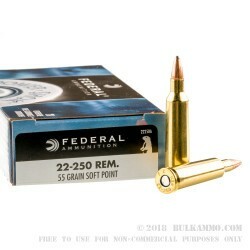 This is the preeminent low-cost coyote round for the .22-250 Remington. 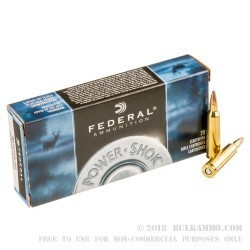 It offers everything you want in a coyote round without any of the baggage of say, the .223 Remington or the disproportionately high costs of other specialty rounds. The soft point POWER-SHOK projectile is 55 grains of flat shooting, coyote devastating power. This round is easily accurate past 400 yards shot out of the right gun. That is more than you can say for a soft point of any other “competing” round. 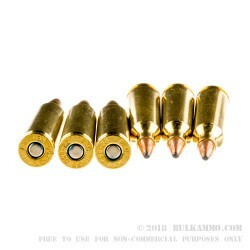 That’s the effectiveness of the .22-250 in flat conditions like meadows and prairies: it can shed wind and provide terminal ballistics at extreme distances without recoil and without tumbling. The fast, flat trajectory makes it a consummate performer. The cartridge is well built on Federal production lines that have a standard that exceeds most competitors for quality control and tolerances, which is why they can continually tout their reliability and it is why consumers keep buying them out of stock everywhere around the country. 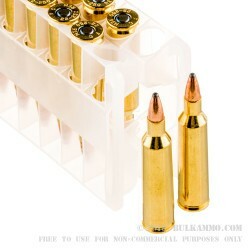 The brass cartridge casing has a Boxer primer in it which allows for the reloader (.22-250 is a perfect round for hot handloads) to easily resurrect the casing.